BIRMINGHAM, AL (September 22, 2018) – Yoshimura Suzuki’s Toni Elias may not have successfully defended his MotoAmerica Superbike title, but he’s hell-bent on making sure he ends up with the most victories. On a sunny and hot Saturday at Barber Motorsports Park, Elias took one step towards that as he won his eighth race of the year, a win that moves him into a tie with newly crowned champion Cameron Beaubier. The two now have eight victories apiece heading into tomorrow’s season finale in the Championship of Alabama. While Elias was able to win his eighth race of the year, his rival Beaubier was down and out, the three-time MotoAmerica Superbike Champion crashing out of what was a three-way fight for victory on the 14th of 21 laps. Bruised and beaten, Beaubier will be back on the Monster Energy/Yamalube/Yamaha Factory Racing YZF-R1 tomorrow to try and win his ninth race of his championship season. The win was not only Elias’ eighth of the season, but it was the 24th of his MotoAmerica career. Second place on Saturday went to early race leader Josh Herrin on the Attack Performance/Herrin Compound Yamaha, the Georgian dropping out of the lead and 7.3 seconds behind Elias at the finish after his back issue from the WeatherTech Raceway Laguna Seca round reared its ugly head. Yamalube/Westby Racing’s Mathew Scholtz finished third, the South African coming out on top of his battle with Yoshimura Suzuki’s Roger Hayden after the two came together in the closing laps. It was Scholtz’ eighth podium of the season. Hayden held on for fourth, some two seconds behind Scholtz and 1.2 seconds ahead of fellow Kentuckian Jake Lewis on the M4 ECSTAR Suzuki. Scheibe Racing BMW’s Danny Eslick was sixth, 2.8 seconds ahead of Monster Energy/Yamalube/Yamaha Factory Racing’s Garrett Gerloff. Bobby Fong got the better of teammate Cameron Petersen on the intrateam Genuine Broaster Chicken Honda battle for eighth. KWR’s Kyle Wyman rounded out the top 10. Going into tomorrow’s final race of the year, Beaubier leads Elias by 56 points with the Spaniard 41 points ahead of Herrin. Scholtz is secure in fourth, 18 points ahead of Gerloff who in turn is 12 points ahead of Lewis. Supersport – Gillim Wins – In The Dry! In Supersport, Rickdiculous Racing’s Hayden Gillim, who has been developing somewhat of a reputation as a “rain rider” this season, with his two previous wins occurring in wet weather, showed his prowess on a dry track when he got the victory over Monster Energy/Yamaha Extended Service/Graves/Yamaha’s JD Beach, who finished second in Saturday’s race after already clinching the class championship in New Jersey. M4 ECSTAR Suzuki rider Valentin Debise returned to form after recovering from his crash in Pittsburgh two rounds ago, and he finished third. In Liqui Moly Junior Cup, Alex Dumas, who clinched the 2018 class championship at New Jersey, led from the pole and, despite the race being red-flagged twice, the KTM Orange Brigade/JP43 Training rider notched his ninth victory of the season with another dominant performance where he was never headed. MP13 Racing’s Cory Ventura finished second aboard his Yamaha, while Quarterley Racing’s Renzo Ferreira finished third aboard his Kawasaki to complete the balanced, three-brand podium. In the Twins Cup class, Saturday’s race was the final one of the 2018 season, and it decided the championship between Ghetto Customs Suzuki rider Chris Parrish and Syndicate/AP MotoArts Yamaha’s Jason Madama. The two riders were separated by just two points going into the finale and Parrish finished eighth, while Madama finished ninth. The outcome was that Parrish won the title by a scant three points. 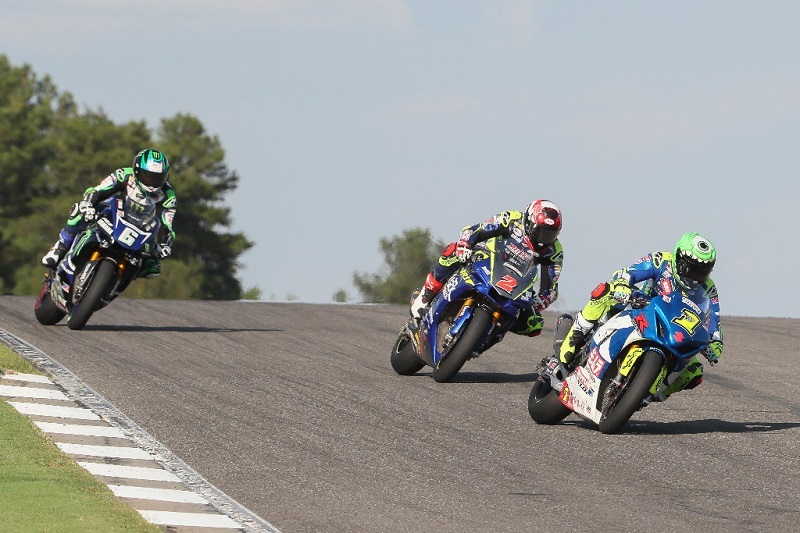 Meanwhile, back at the race, Robert McLendon III was the victor aboard his Altus Motorsports Yamaha in his first-ever MotoAmerica race; Turner’s Cycle Racing’s Kris Turner was second on his Suzuki; and RBoM 180 Racing’s Curtis Murray was third on another Suzuki.